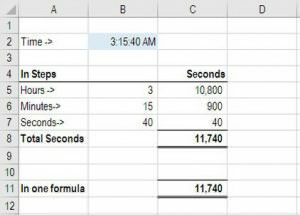 This article outlines how to convert time to seconds in Excel. 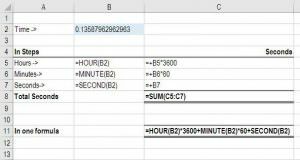 It may be useful to convert the time in Excel from the standard hours and minutes format to seconds only. In order to do this, there are two main methods. The best method is to sum the formulas HOUR, MINUTE, and SECOND to get the total seconds. The following methods determine how many seconds have elapsed from midnight (12 AM). Both methods have Excel convert time to seconds. If we take the example time as being 1:40:30 AM and want to figure out how many seconds that is, we can use the following approach. Step 1 Make sure the time is formatted properly – go to Format Cells (press Ctrl + 1) and make sure the number is set to Time. Congratulations, you have now had Excel convert time to seconds!